To enroll at the Strawberry Patch families must attend a school tour. If you feel that the program is the right fit for your family you will turn in a parent packet and a non-refundable deposit to hold your child’s space. Deposit is equal to one months tuition and our supply/enrollment fee. The deposit is applied to the first month’s tuition. The following is the monthly tuition rate for enrollment at The Strawberry Patch Preschool. We offer a Monday-Thursday program in the morning and afternoon. If multiple children are enrolled from the same family, full tuition is charged for the first child, and a 20% discount is given to all additional children. 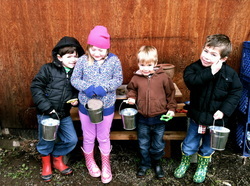 The Strawberry Patch takes both Winter and Spring break in December and March along with the Portland Public Schools. The Strawberry Patch Preschool is closed in August for Summer Break. 4 Half Days: $475 per month. ​Our tuition is broken up into 11 equal monthly installments regardless of breaks or holidays. **If you are looking for a smaller program you can contact Miss Jeanine about the possibility of attending 2-3 days per week. Preference will be given to families looking to attend Monday-Thursday. This fee pays for your child to be officially enrolled at The Strawberry Patch. With their enrollment they will receive the following from our Get Set For School Curriculum: Activity Book, My Book!, Numbers Workbook Set, and a set of Flip Crayons. All of these things will come home with your child once they are completed throughout the year. 1 box of Crayola Washable Markers, 1 large box of Crayola crayons, 1 box of Crayola colored pencils, 1 package of watercolor paints, Kleenex, 1 bottle of foaming handwash, 1 package of dry-erase markers, and 1 pack of white paper.